The Greatest Spaceflight Stories of 2018! 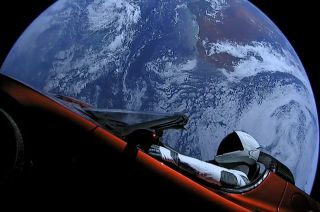 SpaceX's Starman mannequin is seen inside Elon Musk's red Tesla Roadster with Earth in the background, shortly after launch on Feb. 6, 2018. As of Nov. 2, the duo were beyond the orbit of Mars. The year 2018 saw a wide range of milestones in spaceflight, stretching all the way from the sun to the edge of interstellar space. Here are some of the highlights of this year's spaceflight activities. NASA's InSight lander placed its seismometer on Mars on Dec. 19, 2018. The event marked the first time a science instrument had ever been deployed directly onto the surface of the Red Planet. The arrival of InSight was all the sweeter because a leak in the spacecraft's seismometer forced a two-year delay from its original launch date in 2016. At the time, NASA wasn't even sure if the mission could go forward due to the increased cost that fixing the problem would entail. A science review determined that InSight's mission is fundamental to understanding the interior of all rocky planets, including Earth, and that letting it fly would be the best decision on scientific grounds. InSight is now setting up its instruments and should be ready to start gathering science data soon. A Russian Soyuz rocket launches from Baikonur Cosmodrome in Kazakhstan on Oct. 11, 2018. The rocket suffered an in-flight failure, forcing an abort and emergency landing for its Soyuz capsule crew, NASA’s Nick Hague and cosmonaut Alexey Ovchinin. NASA astronaut Nick Hague and Russian cosmonaut Alexey Ovchinin were just minutes into their Expedition 57 flight to space on Oct. 11 when a deformed sensor on their Soyuz rocket forced a launch abort. The two men made an emergency landing in Kazakhstan (the country from which they launched). Hague and Ovchinin emerged in good physical shape and were immediately promised another spaceflight attempt (which was later scheduled for Feb. 28, 2019). For a few weeks, it was uncertain what effect the anomaly would have on the International Space Station, which has been continuously crewed since 2000. The Expedition 56 crew on board said they were ready to stay in space as long as needed, but their flight was technically supposed to last only six months — until late December. After Roscosmos (the Russian space agency) quickly wrapped up the investigation and implemented a fix, the Expedition 58 launch was pushed three weeks earlier to Dec. 3 to let the orbiting crew come home on time. Space station activities will continue a normal rotation, but for the time being, crews will mostly consist of three people instead of six. A United Launch Alliance Delta IV Heavy rocket launches NASA's Parker Solar Probe on Aug. 12, 2018, from Launch Complex 37 at Cape Canaveral Air Force Station in Florida. NASA's latest sun mission, which was decades in the making, will allow a spacecraft to fly through the ultrahot corona for the first time. The Parker Solar Probe lifted off successfully on Aug. 12 on a journey that will see it dip multiple times into the sun's outer atmosphere, giving unprecedented insights into the sun's composition and inner mechanics. One of our star's key mysteries is why the corona is so darn hot. Temperatures there range between 1.8 million and 5.4 million degrees Fahrenheit (1 million and 3 million degrees Celsius). Compare that with the surface of the sun, a far cooler 10,000 degrees F (5,500 degrees C). Scientists suspect that the sun's convection and magnetic fields contribute to the corona's high temperature, but they need observations to back up the theory. The specially shielded Parker will help them come up with the answers, they say. The mission honors pioneering University of Chicago astrophysicist Eugene Parker, who predicted the solar wind (the constant stream of solar particles) in the 1950s. Parker, 91, is the first living person to have a NASA mission named after him. He attended the launch. SpaceX sent an immense rocket to space with a clever public relations campaign that caught the attention of people around the world. The Falcon Heavy launched on Feb. 6, 2018 and quickly unveiled a treat to those watching the livestream: the primary payload was a dummy called "Starman," riding in a Tesla X roadster (an homage to one of SpaceX founder Elon Musk's other companies). The upper stage of the rocket fired the car and passenger out into deep space, toward the orbit of Mars. To say the launch went viral doesn't begin to describe the magnitude of social-media excitement that day. While the stunt caught most of the world's attention, underneath is a serious attempt for SpaceX to break into the heavy-launch market — a very lucrative market that includes military satellites and the ability to launch scientific payloads to other planets on relatively short trips. SpaceX and Musk are heavy proponents of Mars exploration, and SpaceX is developing a giant new rocket-spaceship combo to get colonists there in the coming decades. A SpaceX Falcon 9 rocket launches NASA's Transiting Exoplanet Survey Satellite (TESS) from Florida's Cape Canaveral Air Force Station on April 18, 2018. NASA's quest to find another Earth got a big boost on April 18, when the planet-hunting Transiting Exoplanet Survey Satellite (TESS) made a flawless launch on its way to space. Unlike past satellites, TESS is designed to look for planets near stars in our own neighborhood. Finding planets close to Earth provides a few advantages, such as allowing other telescopes to quickly zero in on these worlds to learn more about their atmospheric composition. TESS will also act as a pathfinder observatory for NASA's James Webb Space Telescope, which is set to launch in 2021 on a science mission that will partly include exoplanet studies. TESS was placed on a unique, highly elliptical, 13.7-day orbit that sees it zoom relatively close to Earth (67,000 miles, or 108,000 kilometers) to send data home before flying out again to 232,000 miles (373,000 km) to perform science observations. TESS will scan the entire sky during its two-year prime mission, although scientists hope that in its stable orbit it can last a lot longer. The probe's first planetary find was announced on Sept. 19 — an evaporating super-Earth. Liftoff of China's Chang'e 4 mission to the moon's far side occurred on Dec. 8, 2018 at 2:23 a.m. Beijing Time (1:23 p.m. EDT/1823 GMT on Dec. 7). China — which wowed the world with a robotic lunar rover mission in 2013 — is trying to accomplish another moon milestone: landing on the far side. The Chang'e 4 spacecraft flew from our planet on Dec. 7 on a quest to land a rover and a stationary lander in early January. Its expected destination is the Von Kármán Crater, which is 115 miles (186 km) wide. The crater is a part of the larger South Pole-Aitken Basin complex, which spans an incredible 1,600 miles (2,500 km). The moon's far side is not visible from Earth and, in fact, was not even imaged until the first Soviet satellites orbited the moon in the 1960s. Landing there presents another challenge because there is no way to communicate information back to Earth without a relay satellite. So China sent a satellite called Queqiao in May, which is poised at a gravitationally stable spot in space called the Earth-Moon Lagrange Point 2. At this location, beyond the moon, the satellite can send information to and from Chang'e 4 and mission control on Earth. An artist's illustration of NASA's Kepler space telescope, which is out of fuel. Kepler team members beamed a decommissioning "goodnight" command to the observatory on Nov. 15, 2018. NASA announced on Oct. 30 that its venerable planet-hunting telescope, Kepler, had run out of fuel, after working far beyond the lifetime of its original science mission. It was quite the incredible journey that yielded 70 percent of the 3,800 confirmed alien worlds to date. Kepler spent its first four years in space (2009 to 2013) gazing at a single patch of sky in the Cygnus constellation, an investigation that yielded 2,327 confirmed exoplanet discoveries to date. After the second of its four pointing devices failed, NASA came up with an innovative way to keep Kepler going; the craft would use the pressure of the sun to stay steady in space, and would study different sectors of the sky over time. This new K2 mission (which lasted four years) not only yielded exoplanets, but studies of comets, asteroids, supernovas and other phenomena. Coincidentally, NASA announced the end of another long-running mission, Dawn, just two days after delivering the Kepler news. Dawn also ran out of fuel. The probe was the first to explore a protoplanet (Vesta) and a dwarf planet (Ceres) up close. Dawn launched in September 2007 and arrived at Vesta in July 2011. There, it remained for 14 months to scrutinize the asteroid's surface; among its many discoveries was finding that liquid water (from meteorite impacts) once flowed on the surface. Dawn's second and final destination was Ceres, where the probe found a bunch of bright spots — salts that were left behind after briny water underground came through Ceres' surface and boiled off into space. Dawn is expected to remain in orbit around Ceres for at least 20 years, but could stay aloft for many decades beyond that. The Hayabusa2 mission's MINERVA-II1B rover (OWL) snapped this photo of asteroid Ryugu right before hopping across the asteroid's surface on Sept. 22, 2018, at 8:46 p.m. EDT (0046 a.m. GMT on Sept. 23). After a more than three-year journey through space, the Japanese Hayabusa2 spacecraft arrived at asteroid Ryugu on June 27 and quickly got to work. The aim of Hayabusa2 is to return a sample of the asteroid back to Earth, just as the original Hayabusa spacecraft did nearly a decade ago. But first, Hayabusa2 dropped onto Ryugu two rovers and a lander, which sent back pictures of a bizarre surface. The German-made MASCOT lander deployed on Oct. 3 and fell 6 minutes to the surface before touching down around the asteroid's southern atmosphere. The little lander survived longer than expected on battery power (some 17 hours), allowing a comprehensive set of pictures to be sent back to Earth. Scientists were surprised at how rocky Ryugu is, compared with other asteroids studied up close. In late September, Hayabusa2 deployed two tiny, solar-powered asteroid hoppers that are now known as HIBOU and OWL. (HIBOU stands for "Highly Intelligent Bouncing Observation Unit"; "hibou" is also "owl" in French. OWL is short for "Observation Unit with Intelligent Wheel Locomotion.") The two bouncers — which remain active today — and the MASCOT lander together are expected to yield much information about Ryugu's history and composition. Hayabusa2 still has another hopper on board that should be deployed sometime next year. The asteroid Bennu, as seen by NASA's OSIRIS-REx spacecraft from a distance of about 50 miles (80 kilometers). The cleverly named OSIRIS-REx ("Origins, Spectral Interpretation, Resource Identification, Security, Regolith Explorer") arrived at its asteroid destination on Dec. 3 — the 1,640-foot-wide (500 m) space rock Bennu. Eventually, OSIRIS-REx will drop to Bennu's surface to pick up a sample for shipment back to Earth. But first, scientists are taking their time to get to know the asteroid and its neighborhood before picking a spot to land. The spacecraft has a full dance card for the next few months, with the first major milestone being getting into a safe orbit on Dec. 31. Over the past few weeks, mission managers have not only been surveying the tantalizing target of Bennu, but also figuring out how the spacecraft would get ready for orbit. OSIRIS-REx had already performed three surveys of Bennu by mid-December, covering about 30 percent of the asteroid's surface in some detail. Circled in red, the hole in the Soyuz MS-09 spacecraft that corresponded to a pressure leak on the International Space Station in August 2018. The hole, which was patched from the inside the station, was exposed and inspected by Russian cosmonauts Oleg Kononenko and Sergey Prokopyev, both Expedition 57 flight engineers, during a Dec. 11, 2018 spacewalk. On Aug. 29, mission controllers monitoring the International Space Station saw a small dip in air pressure — a dip that was quickly traced to a 2-millimeter (0.08 inches) hole in a Soyuz spacecraft attached to the orbiting complex. The leak was never a real danger, but cosmonaut Sergey Prokopyev (after consulting with mission controllers in the U.S. and Russia) quickly plugged the problem area with epoxy, a fix that appeared to address the issue. To make sure, on Dec. 11 two Russian cosmonauts (Prokopyev and Oleg Kononenko) ventured on a spacewalk to rip away the Soyuz outer layers with a knife and scissors and inspect the fix, including collecting samples of the epoxy for later analysis. The hole was on a portion of the spacecraft that is not used for re-entry, so it posed no danger to the returning Expedition 56 astronauts. The cause of the hole has not been fully determined, although reports in the fall suggested it was a manufacturing error that happened while the Soyuz was being constructed in Russia. A full investigation and report should be completed in 2019. An illustration shows the position of NASA’s Voyager 1 and Voyager 2 probes. On Dec. 10, 2018, NASA announced that Voyager 2 had joined Voyager 1 in interstellar space. The two are now outside of the heliosphere, a protective bubble created by the sun that extends beyond the orbit of Pluto. One of NASA's most famous spacecraft reached a cosmic milestone around Nov. 5, when Voyager 2 passed the boundary into interstellar space — the place where the influence of the sun gives way to that of other stars. It's not NASA's first spacecraft to do so; the probe's twin, Voyager 1, made it to interstellar space in 2012. So, Voyager 2 now provides another data point about how the transition zone between the heliopause (the sun's neighborhood) and interstellar space works. The arrival was just the latest milestone for the long-running spacecraft, which launched in 1977 on a "grand tour" of the outer planets. It is the only NASA spacecraft to whiz by the four big outer planets — Jupiter, Saturn, Uranus and Neptune — and its discoveries are numerous, including finding out that all four of these planets have ring features. The spacecraft's plutonium supply will begin to run low in a few years, forcing it to turn off instruments until it falls silent forever around 2025, mission team members have said. Virgin Galactic's VSS Unity spaceliner captured this view of Earth against the blackness of space on Dec. 13, 2018. The space tourism market reached a milestone on Dec. 13 when Virgin Galactic — which has been working to get people into space for a decade and a half — finally saw a crew of two test pilots get to an altitude of 51.4 miles (82.7 km), just past the United States Air Force's space demarcation line. (The Karman line, the more popular space boundary, lies at 62 miles, or 100 km.) The pilots were at the helm of the six-passenger VSS Unity during the spaceliner's fourth rocket-powered test flight. Hundreds of people have put down deposits to fly to suborbital space with Virgin Galactic; the latest ticket price was $250,000. The recent milestone was a big step toward getting some of these customers aloft. Virgin has persisted with its spaceflight plans through numerous development delays, the most famous being design changes implemented afterthe 2014 fatal crash of the previous test vehicle, VSS Enterprise, during a rocket-powered test flight. An Arianespace Ariane 5 rocket carrying the two BepiColombo Mercury spacecraft for Europe and Japan launches from Guiana Space Center in Kourou, French Guiana on Oct. 19, 2018. Mercury has a few years to get ready for its next extended close-up after the joint European-Japanese BepiColombo mission blasted off on Oct. 19. The spacecraft will cruise for seven years around the solar system, picking up speed from planetary flybys, before going into Mercury orbit in 2025. The only mission that has orbited Mercury so far is NASA's MESSENGER, so BepiColombo will provide a rare up-close look at the solar system's innermost planet. To be sure, the next seven years will still be busy for scientists, who have plenty of work as BepiColombo cruises through the inner solar system. For example, BepiColombo will perform precise measurements of Earth's and Mercury's orbits to look for where the theory of general relativity may fall short. Additionally, the two BepiColombo spacecraft will make multiple flybys (six of Mercury, two of Venus and one of Earth), providing ample opportunity to configure the instruments on board, as well as to look for something new or interesting on these planetary surfaces. After relaying live communications during the touchdown of NASA's Mars InSight lander on Nov. 26, 2018, the MARCO B cubesat sent back this farewell image of the planet, taken from a distance of about 4,700 miles (7,600 km). Spaceflight startup Rocket Lab got a big boost in 2018, launching its first operational mission on Nov. 10 and its second on Dec. 16. On this latter flight, Rocket Lab's Electron booster lofted 13 tiny satellites for NASA that reached their target orbit of 310 miles (500 km) above Earth. There, the satellites will perform a variety of missions, ranging from measuring radiation to testing the utility of 3D-printed rocket arms. The California-based company aims to increase access to space by launching cubesats and other small satellites to orbit frequently and affordably. But cubesats are making waves even beyond Earth now; when the InSight mission launched in May of this year, it was accompanied by the first two cubesats to ever leave Earth orbit. WALL-E and EVE (as the two briefcase-size spacecraft were nicknamed) help beam home data from InSight as the lander came in for its Martian touchdown. Follow us @Spacedotcom or Facebook. Originally published on Space.com.